Dr. Jerry Graham , a retired physician from Huntsville, AL and managing partner at IPS, has been going to Haiti on medical mission trips for the last 15 years. He has been led by God to shine Jesus’ love into the prisons in Haiti by meeting a few of their basic needs with a hygiene kit. Dr. Graham had seen a video, https://vimeo.com/3437618 , about a physician, John May, from Florida who had gone into the prison. What Dr. Graham saw on the video broke his heart. The words that Jesus spoke in Matthew 25:44, “Lord, when did we ever see you hungry or thirsty or a stranger or naked or sick or in prison, and not help you?”, came to his heart as he saw this video. The prisoners in Haiti were all the things Jesus mentioned: hungry, thirsty, some naked, sick and in prison. Dr. Graham knows he cannot meet every prisoner’s need but desires to start helping in some small way. He hopes that other individuals, church groups and anyone that God calls to help will respond to the need. Dr. Graham has gotten support already from First Missionary Baptist Church of Huntsville, AL. A prayer group at First Missionary Baptist Church that has been praying for over eleven years has taken on the project to assemble the hygiene kits. 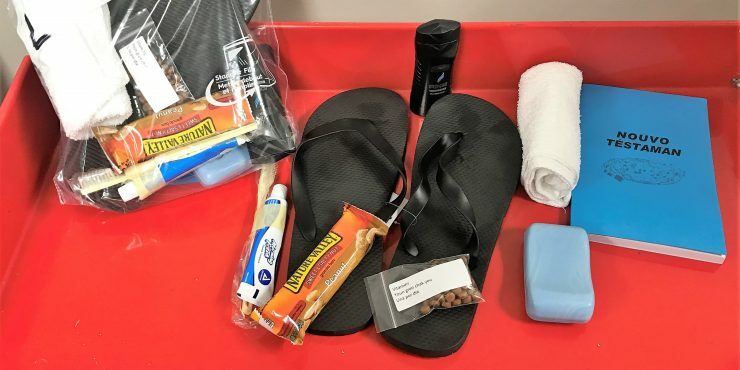 The kits contain a bar of soap, a bottle of body wash, a wash cloth, flip flops, a protein bar, toothpaste and toothbrush, vitamins and a Creole Bible. This prayer group plans to pray over each kit and for the prisoner that will receive the kit. Dr. Graham is hoping other groups will want to do the same. Dr. Graham is partnering with local Haitian Christians to get the Bibles to the prisons and is praying for their future ministry to these prisoners. Dr. Graham is also asking for help from our US Representatives and Senators to help pave the way for these kits to get safely to the prisoners. Please join him in praying that doors will open for the hygiene kits to get to the Haitian prison in Port au Prince. Also, please pray about whether God is calling you or your group to join him in this opportunity to share Jesus’ love by bringing these hygiene kits to His children in prison. Please share this need with anyone that you feel may want to help. Please use whatever means your group uses to disseminate information: newsletter, website, Facebook, Twitter, Instagram, etc. Please feel free to contact us at 256-461-7482 if you need more information. Thank you for your help.